Analysts said it would happen. Professor Stephen Hawking said it should happen. And now it has. Peter Higgs, the man who first predicted the existence of the Higgs boson, or ‘God particle’, has been given a Nobel Prize for his efforts along with Belgian physicist Francois Englert. It’s been a long time coming. For Peter Ware Higgs, an emeritus (or retired) professor at the University of Edinburgh first told us of this tiny but all-powerful particle way back in 1964. Trouble is, it’s taken us a good while to track it down. It took the world’s biggest machine — the Large Hadron Collider (so big it sits in Switzerland but spills out over the French border) and some of the finest minds in science to track it down. But once they did, Peter Higgs was something of a shoe-in for the ultimate gong in science. So, here’s the lowdown on this subatomic bad boy. American physicist Leon Lederman first used the name God Particle in a book; claiming he picked it because the Higgs boson was crucial to understanding the way the Universe works but is also pretty elusive. Lederman joked that he actually wanted to call it the Goddamn Particle because it’s so goddamn hard to find and because of the expense it has caused. After all, the LHC did cost a whacking great £2.6 billion to build and then there’s the electricity bill… But he reckons his publisher would never have gone with the “goddamn” name. As bizarre as it sounds, physicists reckon the universe is filled with an invisible treacle — known as the Higgs field. Some particles interact with it loads, and it gives them a lot of mass. But others, such as particles of light, don’t interact with it at all. In other words, it’s this Higgs field that’s responsible for giving everything — you, me, goats, planets — mass. A Higgs boson is just one tiny, tiny blob of this treacle. The Large Hadron Collider can be thought of as a crash test centre for subatomic particles. It’s operators — the physicists — send protons around circuits and when they’re going fast enough (99.99 per cent the speed of light), they smash them into each other. It’s the wreckage of these collisions they’re interested in. Peter Higgs is receiving his Nobel because Higgs bosons were spotted in the wreckage. Only, they weren’t. Or not directly, at least. The thing is, these crafty little particles actually break down pretty quickly into even smaller ones. And these break down into even smaller ones. And so on. What the physicists have to do is track back through the ‘decay paths’ to see whether there’s likely to have been a Higgs boson at the start. And after some collisions, they think there was. Back in 1964, Peter Higgs wrote two scientific papers, each just a couple of pages of A4 paper long. One of them was accepted by the journal Physical Letters and the other was rejected. Another physicist took a gander and suggested a few tweeks. Peter Higgs added a paragraph saying that in certain conditions the Higgs field would give up a particle — and hey presto the Higgs boson was born and the research paper was accepted. Read lots of accounts about what the Higgs boson is and you’ll discover that it’s the thing that gives mass to everything in the Universe. But it ain’t. 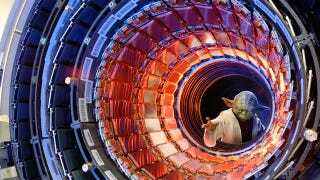 The Higgs field actually just gives mass to what’s known as elementary particles — ones that can’t be broken down into smaller chunks. But all stuff — the aforementioned you, me, goats, planets — are actually made up of composite particles like electrons: particles made up of several components. And with these there’s another force — known as the strong nuclear force — that gives them mass too. In fact, it gives everything most of its mass.